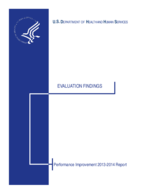 Performance Improvement 2013-2014. How do Public Health Agencies Use and Support Health Information Technology to Support Public Health Functions? Public health agencies have adopted different information systems to help capture data from health-care providers and other sources, but these agencies continue to struggle to establish integrated approaches to sharing information across programs and jurisdictions. This project conducted in-depth case studies of state and local public health departments to identify the ways that these agencies capture and manage data and how agencies exchange information across programs and jurisdictions. Findings from this project included highlighted the need for public health agencies to develop a strategic framework for IT investments and the need to develop models to access and use provider-generated data that will support monitoring care or assessing the status of vulnerable populations. In addition, the adoption of a common meta-data model or scheme for how data elements captured and used in public health relate to one another is critical for assuring interoperability across systems used by different public health agencies and health care providers.